Salmon is one of my favorite types of fish, as long as the filet is juicy and pink in the center. It’s a special kind of fish that is lends itself to many combinations of flavors, such as this recipe where the filets are marinated in a light honey sauce. My brother prepared this dish during one of my visits a few years ago, and it was so exquisito that I immediately asked for the recipe. He loves Israeli couscous with pesto, but I also liked the roasted vegetables used as a garnish. We cooked them over a skillet, but they are also great when grilled or boiled; you can select your own favorite way when preparing this meal. Israeli couscous or Ptitim was created during the late 1940’s in Israel, when rice was scarce and many ethnic immigrants consumed this grain as the basis of their diet. In light of this demand, the government of David Ben-Gurion commissioned the creation of a wheat-derived substitute. The result was so successful, it became the favorite food of children. In a container, combine the honey, white wine, lemon juice and zest, peppercorns and salt. Place the salmon filets inside and close the container. Let refrigerate for 20 minutes. Pour the olive oil into a non-stick skillet over medium-high heat. Sear the salmon filets, skin side down for four minutes. Then turn over and cook for three to four minutes, or until lightly browned. Return the filets to the skin side and cook for a final two minutes. Be careful to not let the salmon over-cook. Separately, boil the Israeli couscous with salt according to the package instructions. When ready, drain and return to the pot, then combine with the pesto. Adjust the sazón as desired. In another skillet, sauté the tomatoes (whole) and zucchini slices with two tablespoons of olive oil. Cook the vegetables until they begin to brown, then turn over and season with salt and pepper. 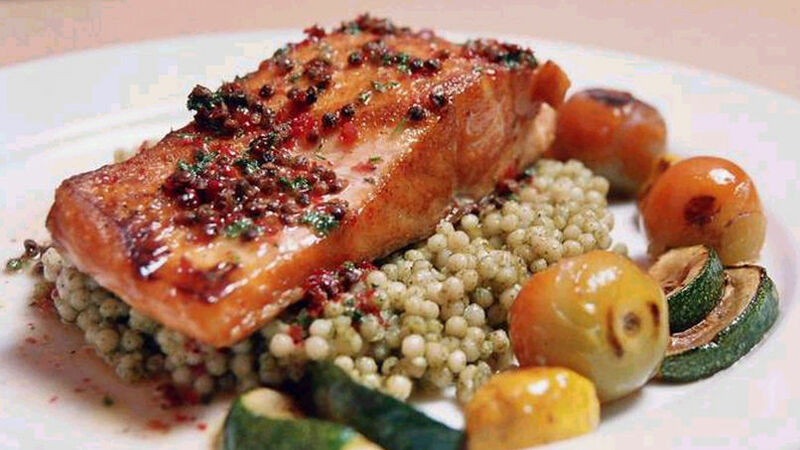 On each of the four plates, place a portion of Israeli couscous in the center with the salmon filet on top. Dress with little juice from the cooked salmon and whole peppercorns. Add some roasted tomatoes and zucchini slices to the side of the salmon. Serve immediately. Trout can be used in place of salmon. If it is difficult to find Israeli couscous, traditional or whole wheat couscous can be used instead. Quinoa also makes an excellent replacement. If you don’t like zucchini, try using asparagus or squash. Despite carrying this name, it’s not very similar to traditional couscous and is more like a pasta. This variety resembles small, pearl-like balls that are boiled like any other pasta, and served with fried onions and tomato sauce, among other versions. Outside Israel, it has a different history as a trendy ingredient used by popular chefs in their creations. What makes it so special, its shape or its sabor?